If you’re thinking about going vegan, there can be a lot of confusing information out there. Fortunately, our vegan guide is just what you need to help you transition from a standard American diet to a happy, healthy vegan lifestyle. Keep reading for a great guide to vegan diets, as well as how to start a vegan diet. We’ve even included a handy vegan restaurant guide! Instead of animal products, vegans eat a wide variety of plants, vegetables, nuts, seeds, and legumes. Most vegans, unlike most vegetarians, consider veganism to be a lifestyle and not simply a diet. As such, most vegans also don’t purchase or use home furnishings, clothing, accessories, or other items that have been produced using animals or animal byproducts. This includes things like leather furniture, leather handbags, and fur accents. There are many, many reasons for people to choose a vegan lifestyle, but one of the most common is a moral reason. Over 16 billion animals are killed each year in the United States alone, and vegans feel a moral compunction to stand up against what they feel is animal cruelty. It’s estimated that one vegan can save up to 100 animals per year! Vegans also point out to the often brutal conditions of animal feedlots, where cows, pigs, and others are abused and treated inhumanely from birth. Another very popular reason for going vegan is for your health’s sake. While you have to remember that things like potato chips and french fries are (technically) vegan, a well-planned and well-executed vegan diet can yield some fantastic health rewards! The Academy of Nutrition and Dietetics recently found that a vegetarian diet can lead to a lowered risk of heart disease and can lead to lower cholesterol levels, blood pressures levels, and possibly even prevent hypertension and type 2 diabetes. It’s also well known that vegetarians tend to weigh less and have a lower overall risk of cancer and chronic disease. Still not convinced that going vegan is healthier for you? More data suggests vegans have healthier guts, improved menopause symptoms, and even less stress. All these results make a lot of sense when you consider the standard American diet: cheeseburgers oozing with saturated fat and fancy coffee drinks loaded with sugar and milk products designed to feed a large, growing calf. It’s not hard to understand why trading fried meals for things like a delicious, crisp kale salad full of colorful vegetables would make anyone healthier! Remember how we mentioned earlier that potato chips are vegan, too? Just like any diet or lifestyle, it’s still possible to make unhealthy choices. Just like an omnivore diet can be extremely unhealthy, a vegan diet can be extremely unhealthy if you don’t make smart decisions about what you put on your plate. You don’t have to follow a vegan diet perfectly from day one, but you should be prepared to learn, try new foods, and do the hard work to make lasting lifestyle changes. No matter your reasons, if you’ve decided to go vegan, we couldn’t be more thrilled for you! 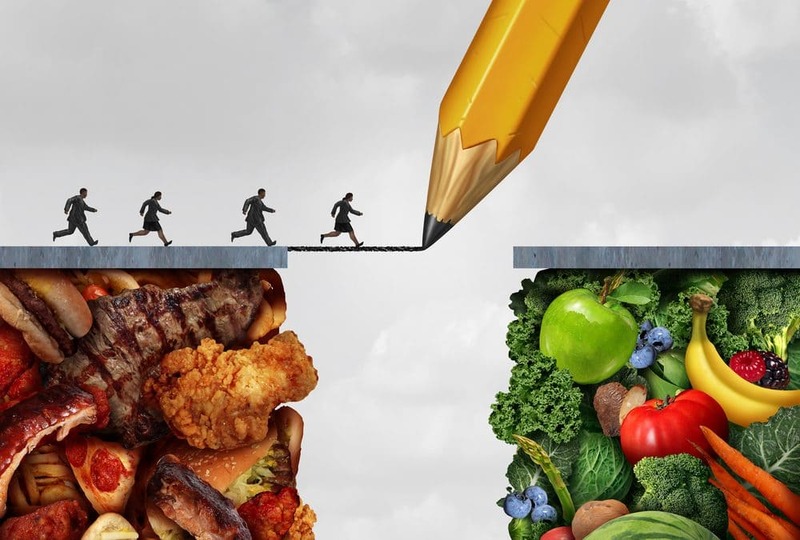 It can certainly be challenging, but we think you’ll feel ample rewards as you learn how to adjust your eating habits and your mindset. One of the first things we recommend before you even begin your journey is to do your homework! If you’re like most Americans, you’ll have to relearn many of the things you used to believe about food (for instance, a glass of milk a day is the best way to get strong bones). A becoming vegan book (such as Becoming Vegan by Brenda Davis) can be extremely helpful. You’ll also need to take responsibility for the nutrient content you’re placing in your body. Any diet can potentially lead to nutritional deficiencies, and it’s important to know how to avoid those and to know what to look out for. Thankfully, there is a ton of great information and resource material (as well as great vegan guides–like this!) available to help you make your transition. They say a plan is the first step, and that’s never truer than when you’re switching to a vegan diet! One very important key to your long term success as a vegan is to find a supportive vegan community, particularly if you don’t have friends or family who are making the switch. Transitioning can be a very lonely and isolating experience, and you’re bound to feel extremely discouraged if you don’t have supportive people who can encourage you and make you feel like you’re not alone. Finally, have compassion on yourself! Lifestyle changes take time and a lot of hard work. You’re in this for the long term, so don’t be discouraged by minor setbacks. Just pick yourself up and keep going! Before you start, we recommend learning a little more about yourself and the options available to you. What is your why? Most people are the most motivated when they have an emotional reason for what they’re doing; what is yours? If you can, create a vision board or tape of a photo that symbolizes what you’re working for somewhere that you can see frequently. We also recommend starting slowly. It’s tempting to want to jump in right away, but that’s usually a recipe for disaster. Choosing one day a week to go vegan is a great way to start; you can gradually add more vegan days to the week as time progresses. You can also start by making simple substitutions from the list we’re sharing next. Replace your coffee creamer with a vegan milk alternative, for example, or switch from a donut on the way to work to making delicious green smoothies in the morning on your way to work. We’ll explain more in our restaurant guide below, but visit new restaurants and explore new menu options. Are there vegan restaurants in your town? What kinds of cookbooks and recipes do your vegan friends use and love? This can be a great opportunity to look for farmer’s markets or local farmers or growers, or maybe even plant a garden or balcony garden! Our vegan guides wouldn’t be complete without a section on substituting meat, dairy, and eggs with vegan-approved swaps! Don’t worry; we’re not going to recommend a diet full of tofu (though when properly prepared, that is a delicious way to enjoy a vegan meal!). Instead, the following list is a simple, easy way to help you keep enjoying the same comfort foods you’ve always loved. Believe it or not, portobello mushrooms and cauliflower make great meat substitutes! We love grilling ‘bellos, bell peppers, and onions and adding them to tortillas with guacamole for a delicious taco. Cauliflowers can also be dredged in a flax egg, dipped in breadcrumbs, and fried in oil for delicious fried “chicken.” You’ll also find tons of great substitutions in the freezer and fridge aisle at most grocery stores. Everything from “chicken” nuggets to “beef” stew to “bacon”, you won’t have to give up on your favorites! Of course, you can also play with traditional soybean products such as tofu, seitan, and tempeh. Each has its own flavor and texture, and learning new recipes to cook and enjoy is just part of the fun! Milk is one of the easiest substitutes to make; you can find soymilk, almond milk, coconut milk, hemp milk, rice milk…the list goes on! Most of these milks are now fortified with more calcium than you’ll find in cow’s milk and some of them are also packed with additional vitamins and minerals, such as omega 3’s (hemp milk). You can use these as 1:1 substitutes during baking and they also taste good in a glass on their own! If your favorite baking recipe calls for eggs, don’t worry. You can still enjoy it even if you’re vegan. Eggs can be replaced by applesauce, mashed bananas, or even mashed avocados. They can also be replaced by flax “eggs” or chia “eggs,” which are made by whisking chia seeds or ground flax in water. As it sits and gels it becomes the perfect binding agent in your baked goods–and it’s packed with protein and omega 3’s, as well! You’re well on your way to vegan success, but first, a vegan restaurant guide as part of our ultimate vegan guides! Thanks to the advent of online menus, eating vegan at a restaurant often simply takes a bit of planning ahead of time. You can look up the menu or call to peruse the menu and ask questions. If you’re lucky, the restaurant will have identified its vegetarian choices, but sometimes it’s a little trickier. When you do call ahead or ask your waiter about ingredients at the restaurant, make sure you’re kind and polite. One of our best pieces of advice is to remember most people just don’t know much about being a vegan, so your job is to educate–but nobody will care if you’re not kind and considerate. If there aren’t options that are strictly vegan, you can also ask about modifying existing options. One example might be at a Mexican food restaurant, where you might ask to replace refried beans with cooked beans (if they’re not cooked with lard or bacon) and to leave the cheese and sour cream off a burrito. Another trick is to keep an eye on the side dishes; sometimes beans, for example, can be added to a side salad to make it a meal, or you can use several delicious, vegan side options to make a whole meal, instead of a single entree. Eating vegan can be the adventure of a lifetime! Now that you know the basics, it’s time to get started on a lifestyle of healthier, happier choices. Good luck!